Submitted by Gerry Mascarenhas on October 1, 2011 - 5:58pm. This morning I had a visit from Yeshwant Ohal's wife and elder son. For the last four days he has been in the ICU of Guru Nanak hospital on a ventilator. At Guru Nanak there is no Social Worker to help economically weak, they just have to pay the bills. There was desperation on the faces of both mother and son. They do have the Teachers Healthcare card which will help them recover part of their expenses. Yeshwant's son works as a driver while the younger son works as a peon in our school. Yeshwant was not one of our teachers who made an impact on us for life, he was a simple peon who swept our School floors and cleaned and watered the grounds. It is people like Yeshwant that make donating for the Teachers Healthcare program even more relevant and worth while. Submitted by denzil on September 17, 2011 - 1:59pm. Composting is one of the best ways you can reduce the amount of waste you are responsible for. It is the most effective and efficient way of returning Carbon to the soil. When Composting is done at source the benefits are multiplied several times. In the past year a few households, societies and institutions in Bandra have not had the need to use the daily BMC garbage trucks that contribute to the many landfills around Mumbai. 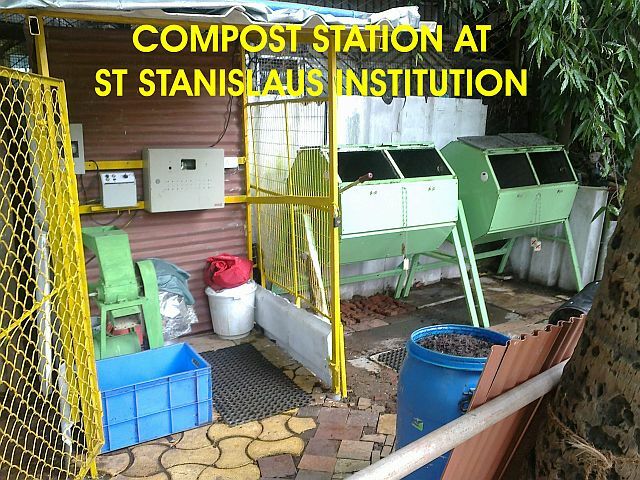 What started off as devising a simple low cost method for conveniently composting food waste for one family on an experimental basis has now spread to 20 other locations with many more in active discussions. The Compost Tumbler has answers to problems faced by those who are already doing composting with varied levels of success; whether the stench, the rodents & cats, lack of space, no soil, meat & fish waste, etc. As it is closed it eliminates these factors as well as making for idealy weather-proof. Ventilation allows fresh air in and drainage ensures ridding of excess moisture. A weather resistant frame with pivots for tumbling the bin results in an ideal aerobic composting environment that can be maintained for many years. All that it needs is our wet and dry organic waste put in, a couple of tumbles a day and about 15 to 20 days later, depending upon conditions conducive, the compost is ready. Submitted by iborges on June 23, 2011 - 8:30am. The attached DNA (22 June'11)news article shows the importance given by the University of Oxford to the Alumni's role in its functioning. Submitted by Gerry Mascarenhas on June 18, 2011 - 9:31pm. Dr Keki Gharda (Class of 1941) we thank you for this fantastic library. This library is an oasis in a concrete jungle that Bandra has become. I hope Stanislites make the time to visit the library. Submitted by denzil on June 11, 2011 - 3:21pm. All said and done it wouldn't have been possible to have such an enjoyable time without the coooperation of everyone who came with us and participated whole-heartedly. We must appreciate Fr Francis D'mello SJ whose guidance was a crucial factor, the brothers Jeffery & Joel who were ever helpful, the Staff led by Giles & Benji for their tolerance and Capt Mel Pais who conducted a recce of the flora & fauna around the villa & sponsored a prize too. In a very great measure to all the youngsters who gave of themselves so wholeheartedly to ensure we had a great time goes the ultimate credit. We need them to ensure that events such as these enhance SSESAs value at ground zero. Probably the one thing that stood out for me was every single one at the picnic participating in the singing of our School Anthem word by word. The cachophony was something to die for. I am posting here a quiz coined from info available on the SESSA & St Stanislaus' HS websites which brings out many interesting facets of our Alma Mater. Some of the posts were debated against at the picnic. Maybe we could help and clear things up. Here we go ... have fun. Submitted by Gerry Mascarenhas on June 6, 2011 - 4:59pm. This article appeared in Sunday Mid-day of June 5th 2011. http://goo.gl/Jqkkj The questions is why can't we share our knowledge and resources across Jesuit institutions around India? There is a lot to learn from each other. Submitted by Gerry Mascarenhas on May 29, 2011 - 11:10am. Submitted by Gerry Mascarenhas on May 3, 2011 - 11:45am. Just heard that Teacher Ida (Mendana) Braganza passed away yesterday. She taught much before my time at St. Stanislaus. Funeral service was held on May 4th 2011 at 4.30pm at St. Francis of Assissi Church, Bandra (West). May she rest in peace. Submitted by Daril B. Atkins on April 30, 2011 - 10:50pm. Since the last one or two years some of my companions from our days in the boarding, reached out to me. The first was Frank (is it the same one called affectionately 'Butler'?). Then there was Joe D'Souza, John Carvallo, and now Philon. I guess we are all in our 60s. Joe D'Souza as I remember was affectionately called 'Chintu' and if memory serves me right, he was a good friend. John Carvallo was the studious one. He took his studies very seriously. And he was also a damn good hockey player. Then there was Philon who I recall was very stylish with a huge puff and handsome too. Well at the current moment John Carvallo is visiting Dubai for his grandson's First Holy Communion. We are to meet tomorrow for the first time after about 45 years. Meanwhile I've just sent Philon in the USA a hello. I was saddened by the news about Bro Toth who passed away. He saved my life when I was about 8 years old when he took me piggy back to a doctor in the middle of the night because I had the pneumonia. The infirmary was my favorite spot when I joined the boarding in 1950 or so. This continued for some years until I became toughened. Joe's technique of giving an injection was like throwing a dart. While his tech of administering an opening dose of Epsom salts was to hold your nose while you gulped the horrible tasting fluid. But the food in the infirmary was just heavenly compared to the refectory food.